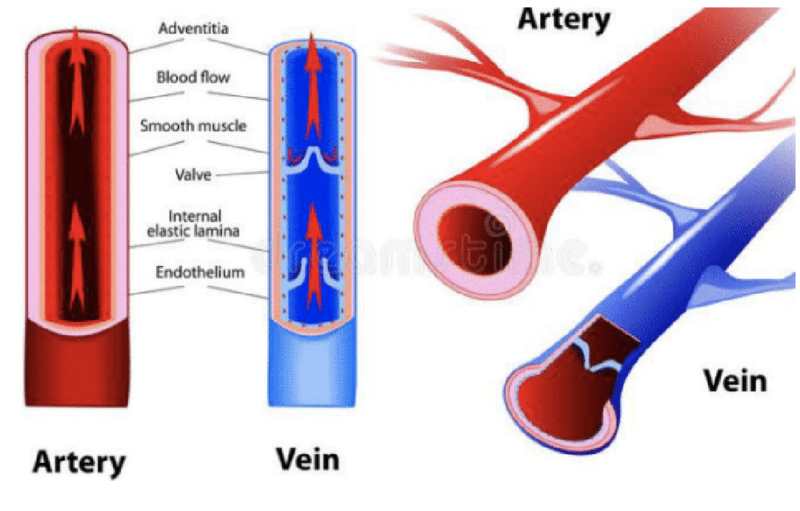 What is an artery and a vein? Veins and arteries are the two types of blood vessels of a circulatory system of a body. All blood vessels starting from the heart are arteries and they carry blood from heart to various body organs. Arteries are of 2 types; Pulmonary and systematic. The former carries impure (de-oxygenated) blood from the heart to lungs to purify it and the latter forms a network of arteries that transport pure (oxygenated) blood from the heart to other parts of the body. Arterioles are further extensions or branches of the (main) artery that aid in transport of blood to smalls or tiny parts in the body. The vessels that transport blood form various body organs to heart are known as veins. The veins are also of 2 types; Pulmonary and systematic. The former transports pure (oxygenated) blood from the lungs to the heart and the latter drains the tissues of the body and supplies impure (de-oxygenated) blood to the heart. Pulmonary and systematic veins can be superficial or seated deep inside the body. Arteries are thick and possess 3 layered walls of muscles and elastin. 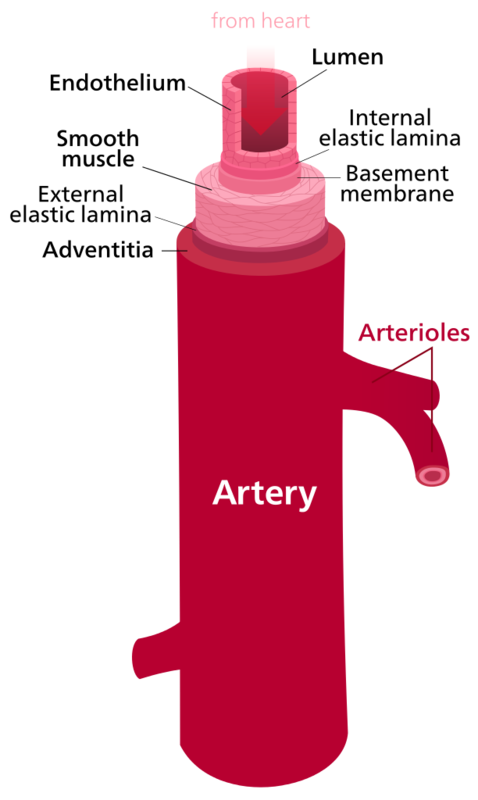 The three layers in an artery are tunica adventitia or tunica externa; the tunica media, and the tunica intima. An artery has no valves except semilunar valves at the base of the aorta and the pulmonary artery. The lumen in the arteries is narrow. Veins have thin walls with few elastic fibres. A vein also consists of three layers as an artery. Valves are present in a vein and the lumen is wider. Since arteries are vital for the blood flow to the body, they are located deeper in the body, closer to the skin and hence remain protected by the skin tissues. 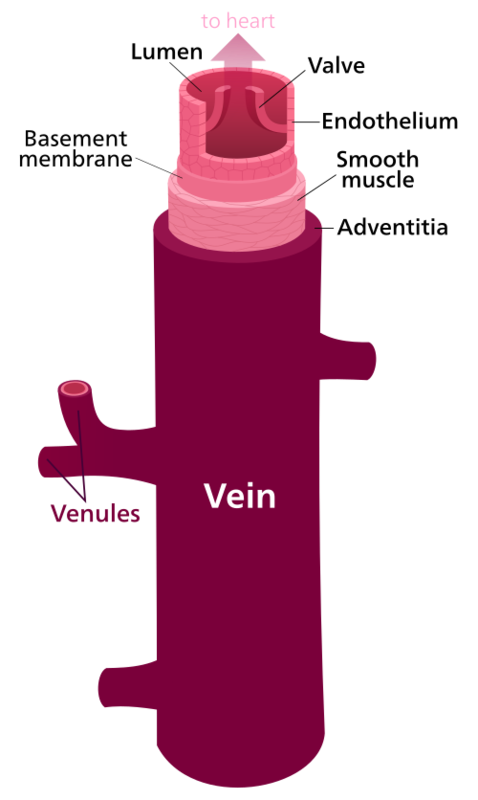 Veins are located close to the skin surface and are at a distance from the corresponding artery. Convergent, difficult to follow interconnections. Connections show irregular networks. Supply can be predicted in arteries. Similar to arteries, exception; Dural sinuses and hepatic portal circulatory system. Blood in the arteries is the oxygenated blood in the circulatory system usually present in the left chambers of the heart and the pulmonary veins. The colour of veins is because of the haemoglobin, to which oxygen merges. De-oxygenated blood is dark in colour due to the colour difference between deoxyhaemoglobin and oxyhaemoglobin. The blue impression of surface veins is triggered by scattered away blue light from the outer side of the venous tissues if the vein is 0.5 mm deeper. Blood colour in veins looks purple through the translucent skin. Pulsation is present in arteries with every heartbeat. Pulsation is absent in veins. The arteries form the basis of the circulatory system and their main function is to transport oxygen and nutritional elements by means blood to all the cells in the body. Arteries also eliminate CO2 and other waste elements, support chemical balance, movement of proteins, cells and other substances of the immune set up. The veins are responsible to carry de-oxygenated blood from the tissues back to the heart. The exceptional veins are the pulmonary veins and the umbilical veins. Blood flows back through coronary sinus and interior venae carvae. Spurty movement of blood with pulse. Pulmonary veins, systematic veins, superficial veins and deep veins. Dr. Amita Fotedar -Dr. "Difference Between Artery and Vein." DifferenceBetween.net. March 26, 2018 < http://www.differencebetween.net/science/health/difference-between-artery-and-vein/ >. Vrancken Peeters, M. P. F., Gittenberger-de Groot, A. C., Mentink, M. M., Hungerford, J. E., Little, C. D., & Poelmann, R. E. (1997). Differences in development of coronary arteries and veins. Cardiovascular research, 36(1), 101-110. Wong, A. P., Nili, N., & Strauss, B. H. (2005). In vitro differences between venous and arterial-derived smooth muscle cells: potential modulatory role of decorin. Cardiovascular research, 65(3), 702-710.